Natural Weigh is owned and run by Robin and Chloe. We are not business people or retail experts but have a passion for our natural world and want to make a difference. Having both previously worked in the environment sector, we have seen first-hand the pervasive nature of plastic pollution. We believe it should be easy for consumers to shop sustainably and that everyday choices make a difference. That's why we started Wales' first zero waste shop here in Crickhowell. For more information about us, see our first blog post. The current disposable culture of society today is storing up massive problems for the future. Single use plastic waste is one of the biggest threats to our natural environment, smothering our wildlife and choking our seas. Not only that, it costs money and resources to make and costs local authorities money and resources to collect and send to landfill. The grocery retail sector is the largest source of plastic packaging. There are very few shops where customers can choose to refill containers or use compostable alternatives to plastic. This is all beginning to change! Natural Weigh aims to offer the alternative. 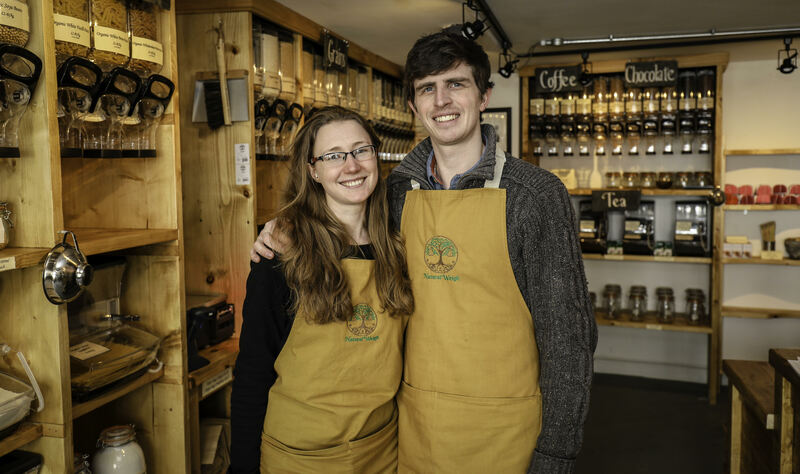 Our purpose is to provide customers a chance to choose a plastic free option when doing their regular shop. We sell organic, additive free food from hoppers straight to your own containers, enabling people to live a more sustainable life. Good for you and good for the planet. We see Natural Weigh as part of the solution to the plastic problem our society is facing. Why not pop in and be part of the solution. We are located in the beautiful town of Crickhowell in Powys, Wales. Crickhowell has an abundance of community spirit which is demonstrated in the purchase and renovation of the Corn Exchange. This historic pub was bought by the community to stop it being turned into a national-chain supermarket. The remarkable story of the local community coming together to make changes is one of the reasons we chose to open Natural Weigh here, and we are fortunate to have secured one of the shops in the Corn Exchange. What's more, Crickhowell won the Great British High Street Award 2018. We are delighted to be part of this town, contributing to keeping the high street alive. For more information on the Corn Exchange story, visit their website here.